The 2012 Open Studios Art Tour application for artists and galleries is available to download! Please read the three page document carefully, as there are a few changes! We are excited to get the 14th Annual Tour started and look forward to posting many-o-blogs for your entertainment (as soon as the applications begin rolling in!). Ah, change. It can be hard, but we think the changes in store for the 2012 Open Studios Art Tour will make this 14th year one to remember! 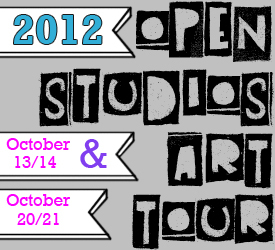 The 2012 Open Studios Art Tour will be October 13 & 14 and October 20 & 21. Visitors will be able to visit artists countywide during both weekends! Artists will either be open BOTH WEEKENDS (Oct. 13/14 and Oct. 20/21), the FIRST WEEKEND ONLY (Oct. 13/14), or the SECOND WEEKEND ONLY (Oct. 20/21). Applications for artists will be online by February 22nd. The 2012 Open Studios Art Tour catalog will be available to download, in print, and (for the first time) as a free app on your smart phone this coming September. If you’re thinking about advertising in the full color catalog, check out these great Early Bird deals, ending next Friday, February 24.